If you are starting your day with coffee and a pastry, a bowl of sugary cereal, or a platter of bacon and eggs try changing that to a healthy breakfast several days a week. According to Anne VanBeber, R.D. 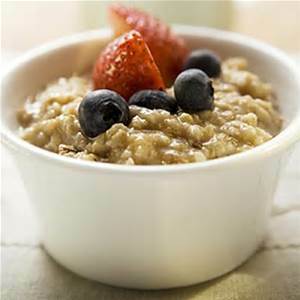 and a professor at Texas Christian University in Fort Worth, changing to a breakfast of 1 cup of oatmeal can reduce you fat and cholesterol intake by as much as 20%. Adding a slice of whole-grain toast can add more plant sterols to get your day off to a healthy start.